Grab a Free Set of Story Starter Posters. We use them to fire kids up, to calm them down, or to keep them engaged while we’re checking homework, returning tests, or taking attendance. The challenge is to begin (or end) class with ones that are worthy of students’ time and attention. Don’t get me wrong, I’m not diminishing the value of pure relationship-building exercises. I use them all the time. But when I find short activities that can build relationships AND improve writing proficiencies in under 10 minutes, fireworks explode around me and Tchaikovsky's 1812 Overture plays on cue. I feel like a teenager experiencing my first crush. This may seem a bit melodramatic (Okay, it is melodramatic.) but even when I push the similes, metaphors, and hyperboles aside, it’s still a heck of a good feeling to watch powerful Bell Ringers in play. I even have a nickname for these bad boys. 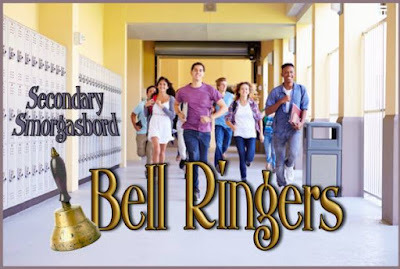 I call them, “Turbocharged Bell Ringers.” And when I find ones that fire kids up, I share them with anyone who will listen. They are (secretly) part of the teacher’s master plan. When students get the opportunity to listen to the different ways that peers respond to a topic or prompt, it gives them a deeper appreciation of the task. And when they have a chance to share their own opinions, students to become more invested in the assignment. 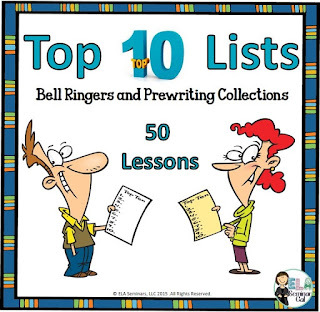 But the BIG PAYOFF of using turbocharged bell ringers is that they will - at some point - help students tackle formal pieces of writing with more confidence, with more enthusiasm, and with less stress. Now, that’s a winning combination! 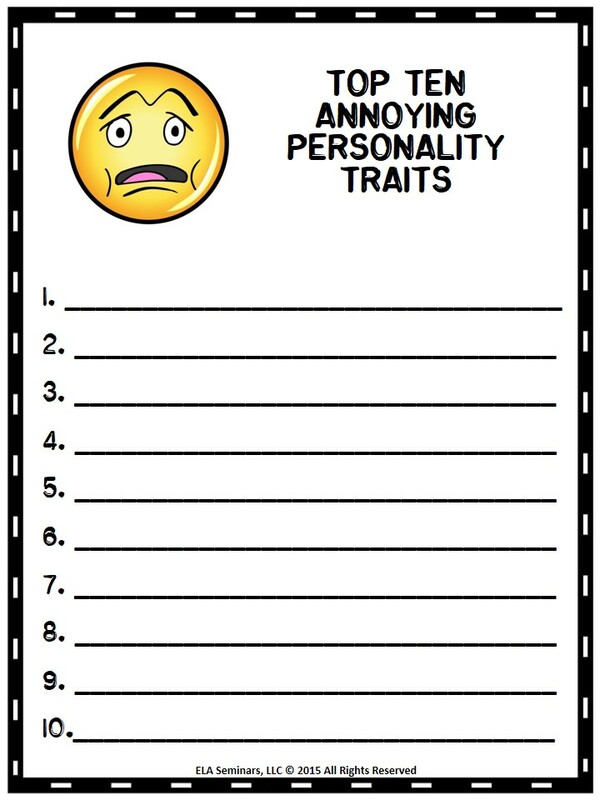 The first Bell Ringer, "Top Ten Annoying Personality Traits," is always a hit with students. 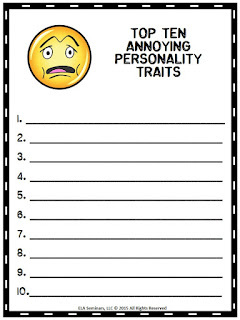 Step #1: Give students 3 minutes to list 5 Annoying Personality Traits. Step #2: When time is called, ask several volunteers to name the trait they despise the most and explain why they find it so annoying. Step #3: Then in Round-Robin style, ask every student to contribute one annoying trait. Class members will add 5 additional traits to their lists until everyone has a personalized Top Ten Annoying Personality Trait List. One of the things I find fascinating about this exercise is how passionate students are about their choices. It doesn’t matter if the annoying trait is a deeply rooted trait like manipulation, a moderately disturbing trait like whining, or a mildly annoying trait like eating while talking – the empathetic peer reactions to students' contributions are priceless. When the assignment is announced, students will head back to the Bell Ringer list in their notebooks, select the three personality traits they'd like to write about, and simply add examples or stories - just like the ones they shared when the assignment was introduced. Warning: If you try to collect the final copies of this assignment without giving students the opportunity to share them, you will – without a doubt – lose popularity points. So if you want to sidestep student scorn, collect them on a day when you have plenty of time to share. I like students to finish or rework this at home so they have plenty of time to think of things that students in the class may not know about them. Many students ask family members and friends to help them complete their lists - so the benefits of this assignment often extend outside the classroom. 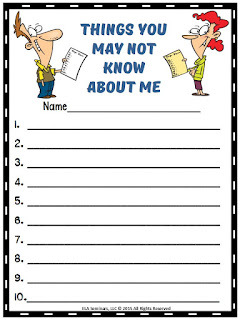 After I collect these lists, I'll pull one out from time to time over the next week or so and read it aloud while the class tries to guess who the “Mystery Person” is. When all of the lists (including mine) have been read, I return the papers and instruct students to write a personal narrative about 1 list item or an essay featuring 3 list items. This is a fun way for all of us to get to know one another, and it's the best topic I know of to make the first writing assignment of the year open-ended and enjoyable. 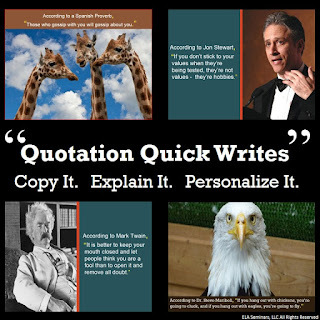 One of my go-to Bell Ringers is the Story Starter Quick Write. Download a free set of story starters. The only rule for drafting a Quick Write is that students write for 3-5 minutes without stopping, erasing, or revising. The goal is to block internal censors and to encourage fluency so that authentic use of language (voice) can emerge. One of the best ways to get kids to write from their hearts is to give them the first line of a story and simply ask them to add to it until time is called. No length is required, and no requirements are imposed. Just write until time runs out. Sharing is encouraged, but completely optional. As long as students write for 3-5 minutes, they have successfully completed the task. Since everyone realizes that these short writing sprints will be very rough (and often very sloppy) they are perfect to use for peer conferences. Even if you are not a fan of peer conferencing, give this strategy a try. It is virtually foolproof and every student can give and receive valuable feedback. Step #1: Write the first word of each of the first five sentences next to the corresponding number at the end of the Quick Write. Step #2: Count the number of words in each the first five sentences and log them next to the words you recorded. Step #3: Skip a line and write the number of the sentence (or sentences) that you liked best - along with a comment. Step #4: Return the paper with your feedback to the writer. 1) Lines 3 and 4 helped me picture the campground. 2) I would change one sentence that begins with “the” and/or shorten one of your sentences. The students have just provided (and received) valuable information. In this example, it is easy to see that three of the five sentences begin with the word “the” and that all the sentences are about the same length. Even without the peer comments, the writer would be able to use the data log to make at least one revision in the Quick Write. As you can probably tell, I like Bell Ringers that get kids moving and talking. But the ones I love also help them to become enthusiastic and confident writers. To receive a monthly newsletter and a welcome package for middle/secondary ELA teachers click here. If you'd like to see what other secondary teachers are using in their classrooms, click on the blog buttons at the bottom of this post. 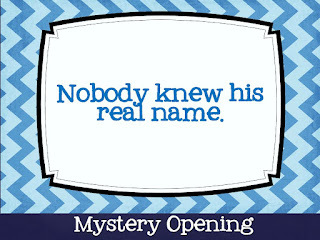 Thanks to ELA Buffet and Desktop Learning Adventures for hosting this month's blog hop, and thank you for stopping by! I'd love you to share an opening or closing activity that might qualify as Turbocharged Bell Ringer. I'll try it out. I'll take pictures. And I'll feature a few of them in a future blog post. Wow! What a great post! So many awesome ideas...I'm off to check out the Top 10 List resource right now! Janice, I love how you sneak in future writing opportunities through your "TURBOCHARGED" bell ringers. There's no way they can say, "I don't know what to write about..."
Wow, Janice! The great ideas in this post just keep coming! I'm right in the middle of a fiction unit right now, and your Story Starter Quick Writes will work PERFECTLY! Hi Maryann! We met at the TpT Meetup in PA. So glad you stopped by! Fun plans! I'm sure the students love these! I am absolutely confident that my students would love the top ten annoying things! I laughed out loud. May have to add that to my bell-ringer options. Thank you so much for sharing. The Top 10 Annoying Traits resource looks fun. I bet we can tie it to the literature we are reading! The Top 10 Annoying Traits is awesome. This is great fuel for any writing topic. Thank you for sharing so many wonderful ideas! Getting kids fired up, especially at the beginning of class, is a great way to keep them engaged and interested in your class. Thank you so much for sharing your enthusiasm and your ideas! So many smart ideas here! I completely agree that warm ups should stimulate discussion and that the we should help students build relationships.